Transform your lawyers and partners into rainmakers. Most leaders at law firms believe if they could unleash the sales potential of their lawyers, they would achieve significant growth for the firm. With intensifying competition, price pressure from clients, and evolutions in buying legal services, it’s more important than ever to enable lawyers to sell. The challenge is that most lawyers aren’t eager, and didn’t expect as their careers progressed, to spend a significant amount of time sourcing clients, winning deals, and expanding their client base. But when firms foster a culture of business development success and when lawyers across all levels are skilled at rainmaking, they achieve the best growth and financial rewards. We teach lawyers how to succeed with business development and bring in a predictable flow of new business, while maintaining a practice of active clients. To maximize growth, you need lawyers at all levels involved in business development. We’ll establish a business development culture across your entire firm. Your lawyers will learn how to sell the full capabilities of the firm and improve their success with cross-selling, upselling, and penetrating accounts. RAIN Group understands law firm business development and what it takes to produce measurable results. 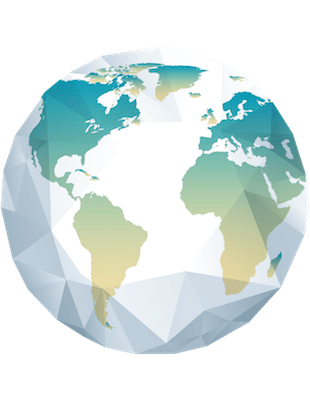 We've worked with leading regional, national, and global firms to help them develop and implement business development programs and succeed in law firm sales. We know the importance of getting lawyers at all levels involved in the business development process early. It doesn’t have to take years of coaxing, practice, and trial and error to turn your lawyers into rainmakers. We know exactly what to do to help you and your teams embrace business development and master law firm sales. We’ve worked with leading regional, national, and global firms to develop business development skills. We speak your language and teach lawyers how to sell by bringing their valuable advice to buyers. Our training programs and methodologies are based on our work in legal sales, along with benchmark research including What Sales Winners Do Differently, Top Performance in Strategic Account Management, and The Top-Performing Sales Organization. 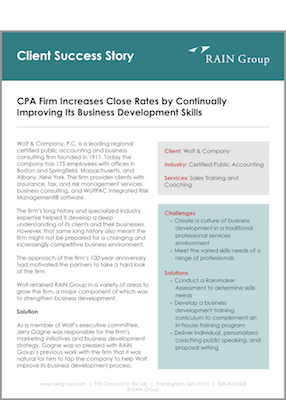 "I've known and admired RAIN Group's work for years, having been to several seminars and programs. I've recommended them team to many industry professionals, and I'm always thanked by these professionals for making the introduction. RAIN Group truly understands and clearly explains how buyers make their purchasing decisions, and by doing so, sellers learn how they can best position themselves to close sales." Find out how RAIN Group helped HRP develop the selling skills of its technical professionals and increase revenue growth by 18%. Take the first step to learn how we can help you transform law firm sales success.